Gingivitis, is inflammation of the gums and can cause periodontitis if left untreated or not managed well. Periodontitis is a very serious gum infection that can damage the jaw bone and cause tooth loss. It may even increase the risk of developing dementia. Many Americans suffer from periodontitis, even those who brush and floss regularly. In fact, an estimated 42 percent of U.S. adults age 30 or older with one or more teeth have periodontitis. One way to be proactive about the health of your gums is adopting a plant- based diet. A whole plant-based diet is considered an anti-inflammatory diet (as opposed to a pro-inflammatory diet). And gingivitis is caused by inflammation, which is also believed to be the root cause of many ailments. A recent study appears to confirm this and suggests that people who adopt a plant-based whole food diet were less likely to have gingivitis. The study involved 30 patients with gingivitis. Participants were randomly assigned to either the experimental group or the control group. “The experimental group changed to a diet low in processed carbohydrates and animal proteins, and rich in omega-3 fatty acids, vitamin C, vitamin D, antioxidants, plant nitrates, and fibers for four weeks,” according to this report discussing the study. The control group did not change their diet. And what I found very interesting about this study was that both groups stopped using dental floss and any other tools that are used to clean in between the teeth. One of the lead authors of the study said, “Study results clearly demonstrate the possibility to naturally reduce gingivitis by an optimized diet that also promotes general health. According to this, dental teams should address dietary habits and give adequate recommendations in the treatment of gingivitis, since it might be a side effect of a pro-inflammatory western diet." And you don’t necessarily need to be vegetarian or vegan to hop on the plant-based bandwagon. 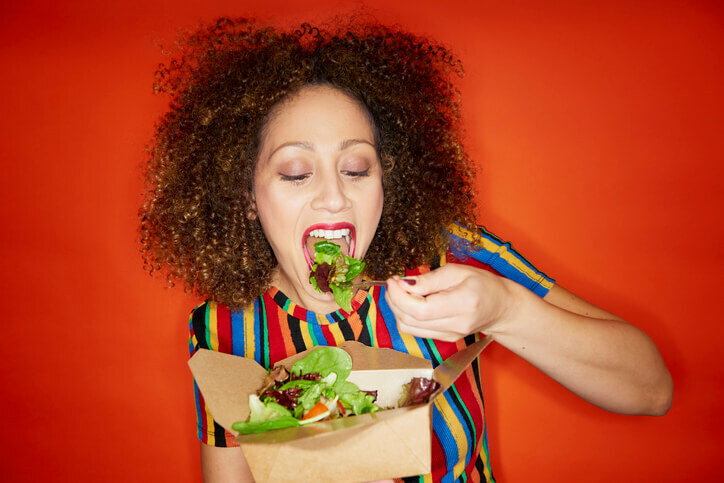 According to a recent study, 43 million Americans are opting for plant-based protein and 86 percent of these people are not vegan. Overall, plant-based foods are very nutrient-dense. They contain essential vitamins and minerals, such as vitamin C, vitamin A, magnesium, phosphorus, iron and zinc (just to name a few), we all need to be our healthiest selves. You may also want to consider plant-based milk alternatives such as almond milk, soy milk, hemp milk or even oat milk. (Read here for specific foods that may help with gum health). For those of you who are vegan or vegetarian, you’re not off the hook. Although there is a wide body of evidence showing that there are so many benefits to eating a plant-based diet, we all have to be mindful about making sure we get an adequate intake of everything our bodies need to function properly and maintain a healthy state. One 2015 study found evidence suggesting that an amino acid, called L-arginine, that is found in a lot of meat and dairy foods helps break down plaque. And excess plaque, of course, may cause gingivitis. So for those of you who are vegan, vegetarian or dairy-free, it might be a good idea to make sure you consumed plant-based foods that are rich in this particular amino acid such as chickpeas, soybeans and lentils. You can also look into using toothpastes and mouthwashes that are fortified with this amino acid. In order to stay healthy and keep your gums healthy, it is imperative to address any nutritional imbalances you may have. Taking routine, comprehensive nutrient tests will help to determine if you have too much or too little of a certain vitamin, mineral or amino acid. If you do, consult a competent healthcare professional who is able to address relevant issues with your diet or prescribe quality supplements where appropriate. So the next time you go to the dentist, he or she should not only be inquiring whether you are brushing or flossing but also whether you are eating plenty of vegetables and fruits and avoiding excess processed foods. If your dentist is not interested in your diet, you should probably find one that does.